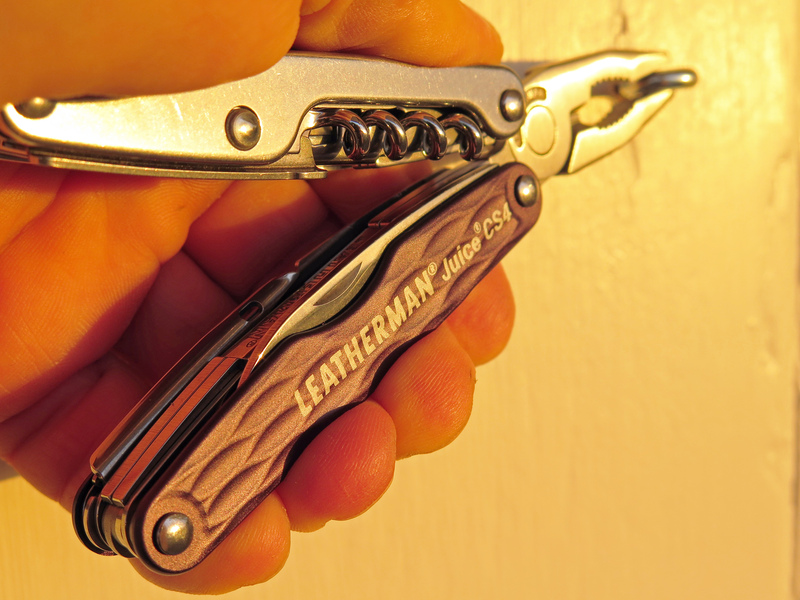 Leatherman tools are synonymous with guys who, unlike travel writers, really work for a living. On a daily basis a carpenter or a painter can extract a Leatherman Wave from their belt and address just about any imaginable challenge. As an author I have my tablet, my laptop and my other ‘devices’, but as a travel writer I require additional tools when I’m on the road. No, not just a cork screw or a pocket knife. All kinds of issues come up when you’re in foreign lands and an every-day carry multi-tool with screw divers, scissors and the like is a blessing. At 3.5″ in length, it’s not too large and not too small. Here it’s side by side to my dad’s WWII era Inox pocketknife–the EDC of its day. 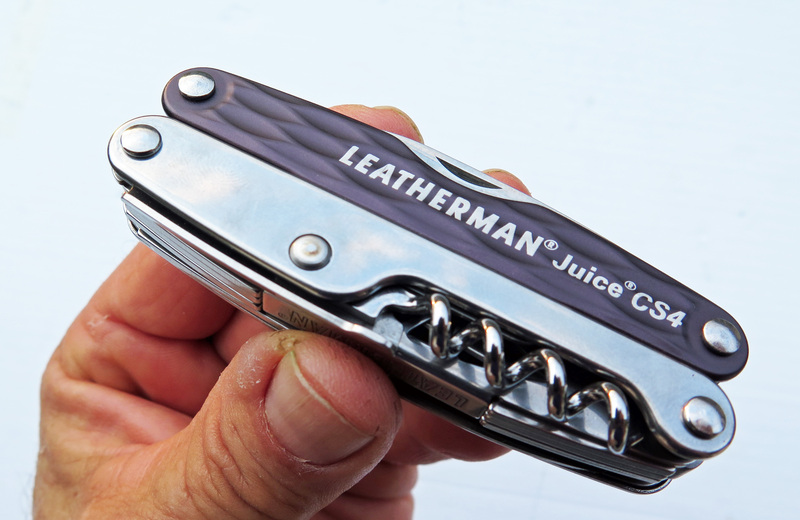 Leatherman has created the “Juice” series of multi-tools that are made for guys like me, who generally dwell in an urban environment but may find themselves just about anywhere. 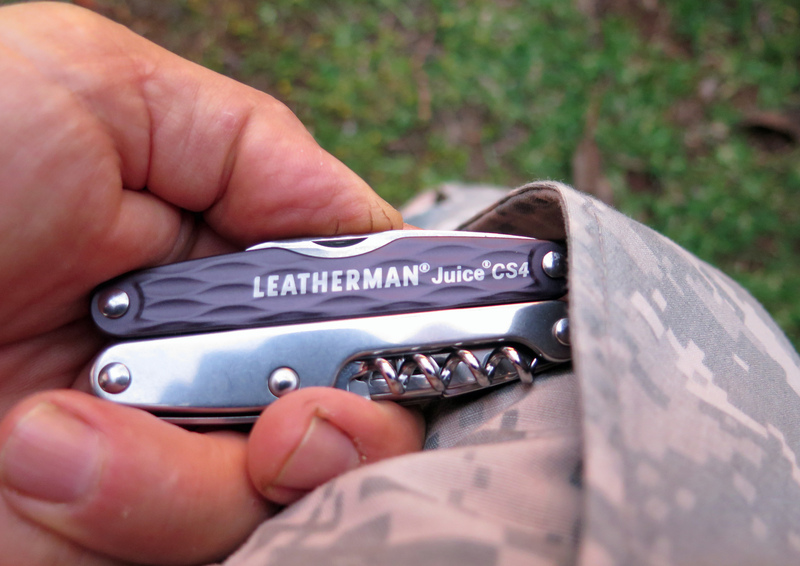 The item I chose to review for this piece, the Juice CS4, is the second largest multi-tool in their line of pocket-sized offerings. (Essentially it’s a streamlined version of their Juice XE6). It has a few less functions than the XE6 and hence takes up less room in your pocket. At 3.5 inches in length it’s small enough and just skinny enough (.653 inches) to comfortably carry around without a sheath. It’s got 15 tools which include all the standard stuff you need for fixing or repairing needs that may pop up whether you’re in Fiji or Philly. The standard Mr. Fixit stuff includes needlenose pliers, regular pliers, hard-wire cutters, wire cutters, 420HC knife, spring-action scissors, awl, Phillips screwdriver, medium/large screwdriver, small screwdriver, extra-small screwdriver. Yes, you can even uncork wine bottles but not always easily. 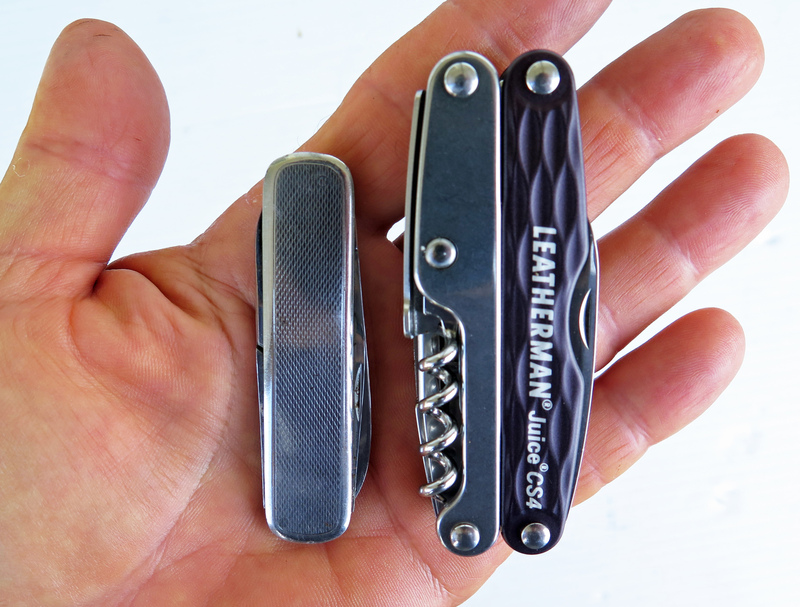 In addition, it has a few items that won’t be found in the more utilitarian Leatherman offerings but are welcomed if you’re camping in the Rockies or on a picnic in Marlborough, New Zealand. These include a saw, can opener, bottle opener and corkscrew with assist. So what else do I like about it? Fit and finish (granite gray color) are superb and aesthetically pleasing. It’s easy to hold—the ergonomics are excellent. Everything works splendidly. Well, most everything. The only item I wasn’t 100% happy with was the cork screw. It comes with an assist that allows you to use the rim of the bottle for leverage. Makes sense in theory but it’s a bit unwieldy in practice. I’m not sure if it’s the geometry of the function (keep in mind it’s a small tool) or that the “assist” doesn’t allow much purchase on the glass rim. You can leverage the cork out an inch or so using the assist but then it’s easier to use elbow grease, as the old timers say, and simply yank it out. However, this is not a deal breaker by any means. You’ll get your cork out in the end. Those pliers come in very handy and they work splendidly. It has enough functions to take care of most all your needs and is small enough to be practical. If you’re going to take a tool with you on a trip, the last thing you want is some bulbous multi-tool rocking around in your pants pocket and the CS4 passes that test with flying colors. Note that it’s not a heavy-duty tool, such as the Wave. As my friend David, a tradesman who uses the Wave daily, said, the Juice is a “gentleman’s” EDC tool rather than an industrial strength work tool. Handy to take camping or on the road, it easily fits in your pocket. I recommend it. 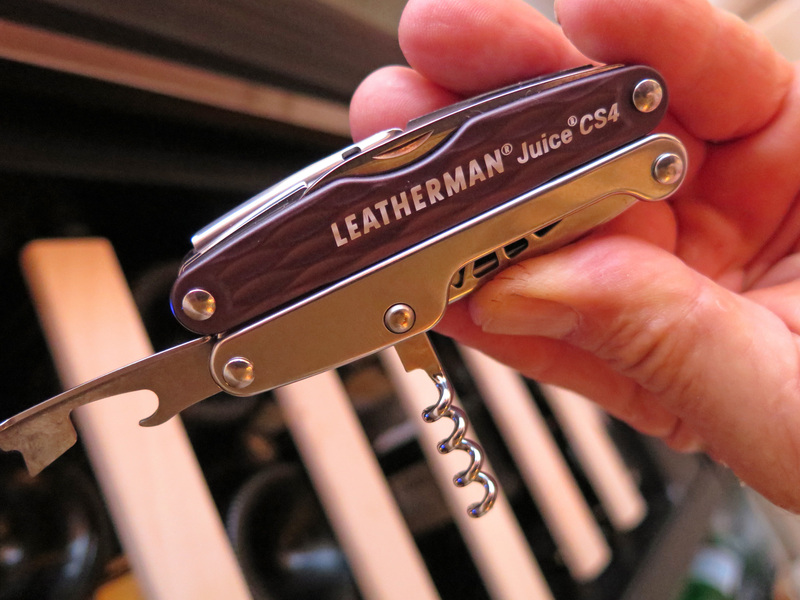 That said, I have no reservation recommending the Leatherman Juice CS4 for travelers, campers or urban gentlemen/gentlewomen. Just remember that if you’re travelling by plane, not to bring it in your carry-on luggage. The TSA agent will confiscate it (because of the blades and corkscrew). Stow it in the suitcase so that it goes in the cargo department and our friends who maintain security at the airports will be happy. Leatherman has a 25 year guarantee, so you’ll be set for quite a while. Next articleThinkTech: SBA Hawaii Offers Plenty!